Astronomers have discovered a most bizarre celestial object that emitted 40 visible-light flashes before disappearing again. It is most likely to be a missing link in the family of neutron stars, the first case of an object with an amazingly powerful magnetic field that showed some brief, strong visible-light activity. This weird object initially misled its discoverers as it showed up as a gamma-ray burst, suggesting the death of a star in the distant Universe. But soon afterwards, it exhibited some unique behaviour that indicates its origin is much closer to us. After the initial gamma-ray pulse, there was a three-day period of activity during which 40 visible-light flares were observed, followed by a brief near-infrared flaring episode 11 days later, which was recorded by ESO's Very Large Telescope. Then the source became dormant again. "We are dealing with an object that has been hibernating for decades before entering a brief period of activity", explains Alberto J. Castro-Tirado, lead author of a paper in this week's issue of Nature. The most likely candidate for this mystery object is a 'magnetar' located in our own Milky Way galaxy, about 15 000 light-years away towards the constellation of Vulpecula, the Fox. Magnetars are young neutron stars with an ultra-strong magnetic field a billion billion times stronger than that of the Earth. “A magnetar would wipe the information from all credit cards on Earth from a distance halfway to the Moon,” says co-author Antonio de Ugarte Postigo. 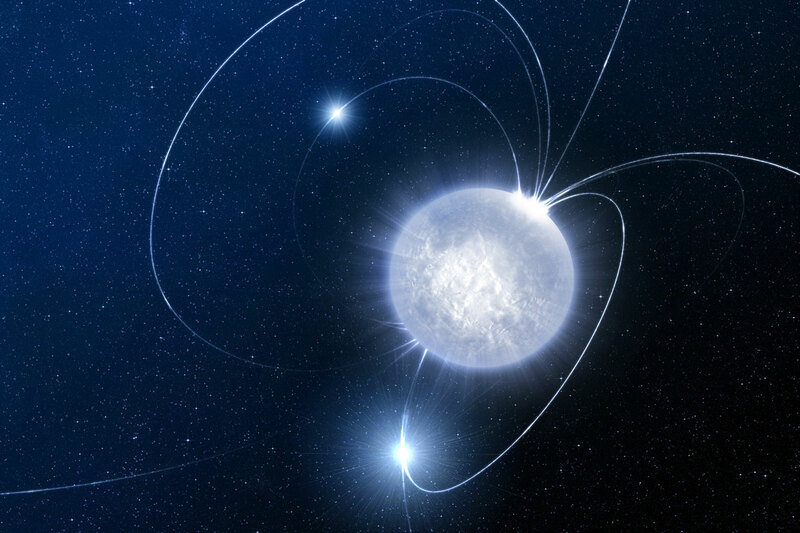 "Magnetars remain quiescent for decades. It is likely that there is a considerable population in the Milky Way, although only about a dozen have been identified." Some scientists have noted that magnetars should be evolving towards a pleasant retirement as their magnetic fields decay, but no suitable source had been identified up to now as evidence for this evolutionary scheme. The newly discovered object, known as SWIFT J195509+261406 and showing up initially as a gamma-ray burst (GRB 070610), is the first candidate. The magnetar hypothesis for this object is reinforced by another analysis, based on another set of data, appearing in the same issue of Nature. Castro-Tirado A. J. et al. 2008, Flares from a candidate Galactic magnetar suggest a missing link to dim isolated neutron stars, Nature, 25 September 2008. A paper by Alex Stefanescu et al. in the same issue of Nature confirms the magnetar hypothesis. The team is composed of A. J. Castro-Tirado, A. de Ugarte Postigo, J. Gorosabel, M. Jelinek, M. A. Guerrero, F. J. Aceituno, R. Cunniffe, P. Kubanek, S. Vitek (IAA-CSIC, Granada, Spain), T. A. Fatkhullin, V. V. Sokolov, E. Sonbas, S. A. Trushkin, N. N. Bursov, and N. A. Nizhelskij (SAO, Russian Academy of Science), P. Ferrero, D. A. Kann, S. Klose, and S. Schulze (Thuringer Landessternwarte Tautenburg, Germany), D. Sluse (Laboratoire d'Astrophysique, Ecole Polytechnique Fédérale de Lausanne (EPFL) Switzerland), M. Bremer and J.M.Winters (IRAM, Saint Martin d d'Heres, France), D. Nuernberger (ESO, Santiago, Chile), D. Perez-Ramirez (Universidad de Jaen, Spain and University of Leicester, UK), J. French, G. Melady, L. Hanlon, and B. McBreen (University College Dublin, Ireland), K. Leventis and S. B. Markoff (University of Amsterdam, The Netherlands), S. Leon (IRAM, Granada, Spain), A. Kraus (Max-Planck-Institut für Radioastronomie, Bonn, Germany), A. C. Wilson (University of Texas, Austin, USA), R. Hudec (Astronomical Institute of the Czech Academy of Sciences), M. Durant, J.M. Gonzalez-Perez, and T. Shahbaz (IAC, La Laguna, Spain), S. Guziy (Nikolaev State University, Ukraine), S. B. Pandey (Aryabhatta Research Institute of Observational-Sciences, India), L. Pavlenko (Crimean Astrophysical Observatory, Ukraine), C. Sanchez-Fernandez (European Space Astronomy Centre, Madrid, Spain), and L. Sabau-Graziati (INTA, Madrid, Spain). Antonio de Ugarte Postigo is now affiliated with ESO, Chile. 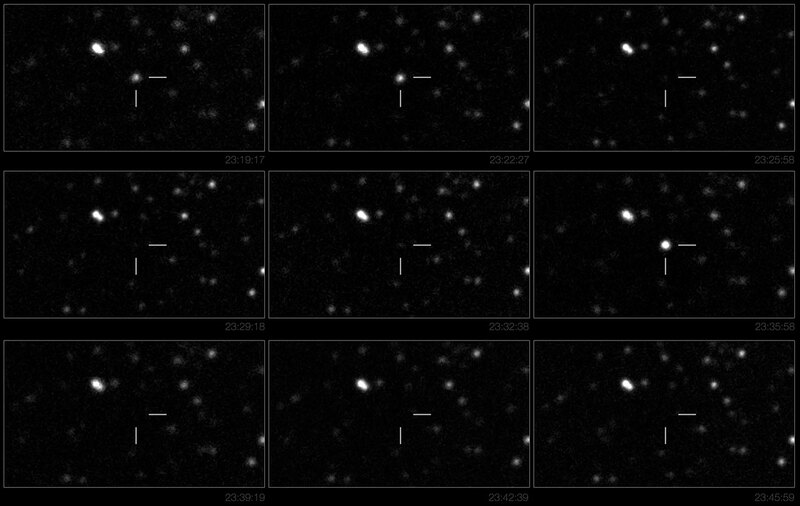 The 42 scientists used data taken by eight telescopes worldwide, including the BOOTES-2 robotic telescope at EELM-CSIC, the WATCHER telescope at Boyden Observatory (South Africa), the 0.8-m IAC80 at Teide Observatory (Spain), the Flemish 1.2-m Mercator telescope at Observatorio del Roque de los Muchachos (Spain), the Tautenburg 1.34-m telescope (Germany), the 1.5-m at Observatorio de Sierra Nevada (IAA-CSIC), the 6.0-m BTA in Russia, the 8.2-m VLT at ESO in Chile and the IRAM 30-m Pico Veleta y Plateau de Bure telescopes, together with the SWIFT (NASA) and XMM-Newton (ESA) satellites. Neutron stars is the bare, condensed remain of a massive star which started its life with between eight and fifteen times the mass of the Sun, but then expelled its outer layers following a supernova explosion. Such stars are only around 20 kilometres in diameter, yet are more massive than the Sun. Magnetars are neutron stars with magnetic fields hundreds of times more intense than the average neutron star fields. The energy release during one flare in the course of a period of activity can amount to the energy released by the Sun in 10 000 years.